Each year, the prestigious Bonhams Quail Lodge Auction is the place to be and view some of the most incredible luxury supercars in person. Car enthusiasts can relive their glory days of youth or view the hottest luxury supercars on the market today. Covering four decades, many of the best and rarest supercars will be on display and available for auction. The auction will be held once again at Quail Lodge & Golf Club. This luxury resort is found beautiful Carmel Valley, California. The Bonhams Quail Lodge Auction takes place on this Friday, August 19th. This popular event is also being held during the iconic Pebble Beach Car Week. 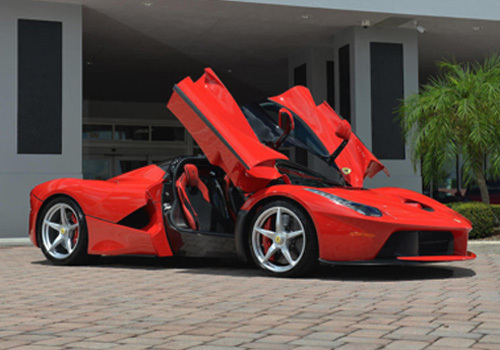 The supercar that everybody is talking about is the 2014 Ferrari LaFerrari (photo above). It’s arguably the top of the list when discussing most popular supercars over the last 10 plus years. Only 499 2014 Ferrari LaFerrari cars were manufactured, so you know your looking at a true, limited edition supercar. In fact, just 120 were shipped to the U.S., so unless you travel around the world, personally seeing one is quite rare. What makes this beautiful 2014 Ferrari LaFerrari so unique, is it’s the very first one to go on sale publicly. You want practically a pristine car, you got it. This luxury, V12 hybrid superar has only 230 miles on it. That’s it! If you’re a die-hard car collector or just want own the 2014 Ferrari LaFerrari, this is your rare chance. Bonhams has placed an estimated value on the LaFerrari at between $3.6 and $4.2 million. That’s a lot of money, but for some …. worth every penny. But that’s not all. This supercar auction is offering a selection of elite vehicles, covering Germany, Great Britain and Italy. Here’s a sample of what you can expect to see and bid on at the upcoming car auction. This Porsche Carrera GT is perfect condition. With only 2,000 miles, the sporty GT is equipped with a removable top. The car’s silver metallic over terracotta color scheme looks impressive. Bonhams has an estimated value on the 2005 Porsche Carrera GT of between $600,000 and $750,000. If you want to figure out which Ferrari model most closely matches the company founder’s legacy – Enzo Ferrari, it’s the 1989 Ferrari F40. The classic F40 by Ferrari going up for sale has only 2,800 miles or 4,500 km. This baby really turns heads and would make the perfect purchase for anyone. Bonhams has estimated the sell price for to 1989 Ferrari F40 to be $1.0 to $1.2 million. Only 20 models of the 2008 Lamborghini Reventón (photo below) where ever made. This meticulous supercar doesn’t even have 1,000 miles on her. It’s been professionally maintained and really well cared for. Bonhams has an estimate of $1.2 to $1.6 million for this extremely, limited edition 2008 Lamborghini Reventón. The sensational 2014 McLaren P1 hypercar (photo below) is special. As only 375 were ever built, this particular mode is number 90. Like the others, this McLaren comes with just under 1,200 miles. What more can you say, but to see it person is really a VIP experience. Bonhams has placed a value of between $1.9 to $2.1 million for this 2014 McLaren P1. This model (photo below) is extremely popular and high on the list of most Ferrari car lovers As far as sports-racing cars go, this one sets the standard. When the 288 GTO first was introduced, it’s radical body design shook up the industry. Only 272 where ever built, and this car has only had one owner. But don’t worry, it’s now available for you to buy and become its second owner. Bonhams has estimated the auction price of this 1985 Ferrari 288 GTO to sell from $1.8 to $2.2 million. The history of Bonhams is mind blowing. It was originally founded way back in 1793. The brand is synonymous with prestige. The luxury brand is definitely one of the world’s leading auctioneers of both antiques and fine art. You will need to contact Bonhams directly to get registered. In case you can’t attend the Bonhams Quail Lodge Auction in person, you will be able to bid online. We hope you can attend and bid on a luxury supercar. Let us help make your last minute travel plans to the Bonhams Quail Lodge Auction. Stop by soon to follow our luxury blog and stay on top of the latest car industry news and model releases.